Fighting Style: Defensive                    Fighting Style: Offensive? 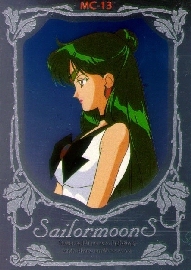 Okay, so how exactly would Sailor Mercury match up to Sailor Pluto? Well, we put both Sailor Senshi in a high-tech space age computers, and we took the information supplied by us and a special team of animators to come up with the ultimate match up! Unfortunately, the animation would take just way too much disk space, so we have our commentators do it for us. Straight from the Death Buster Headquarters we have Cyprine and Pikuroll! Cyprine: Heh heh, busy, heh heh. Pikuroll: Heh heh. Anyway, today's battle has the most boring Inner Senshi, Sailor Mercury, against the most boring Outer Senshi, Sailor Pluto! Pikuroll: AHEM. And the race is off! Pikuroll: Pluto repels the bubbles with her Garnet Rod by doing the little twirly thing! The bubbles fly back and wack into Mercury. Cyprine: Ouch, she falls to the ground! I think she's bleeding, and those were only bubbles! Man, she must be weak! Pikuroll: Pluto watches Mercury have some spasms on the ground before the other finally gets up. Mercury yells out, "Mercury Aqua Mirage!" at her, but Pluto holds up her Garnet Rod and yells, "Time Stop!" Cyprine: Ooh, that's right! Pluto's specialty is in time! Mercury's attack stops midway. She looks like she's trying to move but she can't! Mwahaha! Pikuroll: Then Pluto starts punching her in other areas of Mercury's body. Owww... Mercury's starting to bleed again... Eww. Cyprine: Hmm, time thingy spell's wearing off, and Pluto seems to know it... Oh! What's she doing?! Pikuroll: It looks like she's... dragging Mercury over in front of her suspended attack! Ingenious! Cyprine: The spells over, and the before Mercury can move out of the way, her Aqua Mirage slams into her, and she screams as she's bashed by her own attack! Pikuroll: She definitely looks pissed... Mercury screams out," Mercury Aqua Rhapsody!" Pluto looks bored, though, so she yells back, "Dark Dome Close!" Cyprine: Looks like Merc-chan lost again... Hehehe. Pikuroll: See you next time when we pit Mercury against another Sailor Senshi! Same Mercury time, same Mercury channel! Cyprine and Pikuroll: Ja ne!